Ivo Josipovic, the Social Democratic Party's (SPD) candidate supported by the People's Party-Democratic Liberals (HNS), the Democratic Party of Istria (IDS), the Pensioners' Party (HSU), the Greens as well as by the outgoing Head of State Stipe Mesic came out ahead in the 2nd round of the presidential election on 10th January in Croatia. He won 60.2% of the vote ahead of Milan Bandic who won 39.74%. The Mayor of Zagreb was excluded from the SPD after announcing that he was running. He was supported by the Democratic Farmers' Party (HDSS). During the 1st round of the election on 27th December Ivo Josipovic took the lead over his rival with 32.42% of the vote against 14.83%. Turnout rose to 50.13% in the 2nd round of the election. Ivo Josipovic is now the new Croatian President. "It is the victory of every citizen who is counting on having a better, fairer Croatia," declared Ivo Josipovic when the results were announced. "I want to fight uncompromisingly against corruption and organized crime. It is what I promised and it is what we shall build. I firmly believe that we all want a better Croatia with more justice, that we want a country where work is paid for with a wage and where crime is punished," he added. The new Head of State promised his fellow countrymen "a return to morality in the political arena," and is rapidly due to address this scourge that is still rife in the country. "On the first day of my term in office I shall ask the secret services to focus their work on corruption and organized crime. It will be my first task and the reports the experts deliver will not be pushed to the bottom of the pile," he declared. The fight against corruption is a crucial point in negotiations between Zagreb and Brussels and a condition for Croatia's integration. The European Union expects the new Head of State to support government work in this area. "With Ivo Josipovic and Jadranska Kosor Croatia now has a kind of dream-team. They may work very well together and this is what will help Croatia become a country with true rule of law – this is the primary condition to integrate the European Union," declared Zeljko Trkanjec, a political expert and journalist for the daily Jutarnji List. Ivo Josipovic was able to take advantage of a waning in power that has affected the government by Jadranska Kosor (HDZ) which has suffered because of several financial scandals and due to the discontent of the Croats, greatly affected by the economic crisis and the decline in their living standards. Ivo Josipovic benefited from his low popularity rating and his lack of experience which helped to make him stand out as a different candidate. Between rounds Milan Bandic tried to win the support of the HDZ and played on his image as a man of the people attempting to turn Ivo Josipovic into the representative of the elites. Milan Bandic toughened up his approach and won the support of the hierarchy of the Catholic Church thanks to the Archbishop of Zagreb. "With Ivo Josipovic the Croats will choose a President of the Republic who will not cause problems when the government implements a pro-Western policy. However Milan Bandic is the bearer of uncertainty," declared political analyst Davor Gjenero just before the second round. 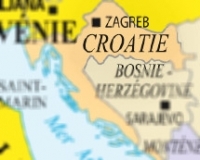 "The vote was a referendum to discover whether the Croats want a European, modern Croatia," indicated Ivo Josopovic's campaign director, Mirando Mrsic. "I think that Ivo Josipovic will support the government's work and that we shall be able to work well together for the good of all of the citizens," stressed Prime Minister Jadranska Kosor. Ivo Josipovic has been an MP in the Hrvatski Sabor, the only Chamber in Parliament since the general elections on 23rd November 2003. A graduate of law and music from the University of Zagreb, he teaches both subjects. In 1985 he won the EU's first prize for radio and TV for his work Samba da Camera. The other major political event was the surprise return at the beginning of January of former Prime Minister (2003-2009) and former HDZ leader (200-2009) Ivo Sanader. The 56 year old, former head of government, decided to withdraw from political life in July, two years before the end of his mandate without giving any real explanation to this retirement. In the summer he was appointed honorary chairman of the HDZ. Ivo Sanader, who said that he made a mistake when he resigned last year, justified his return by the "poor" situation in which his party finds itself and by the failure of its presidential election candidate Andrija Hebrang (who came third in the first round with 12.04% of the vote). The former Prime Minister was however the origin of the candidature of Andrija Hebrang for the supreme office (the party then approved his suggestion). Ivo Sanader criticised the leadership and the competence of the present head of government Jadranska Kosor. The former Prime Minister was excluded on 4th January. This return to politics indeed comprises a serious threat to the party that already has to manage a difficult socio-economic situation. The defection of certain HDZ MPs may cause the party problems in Parliament and endanger its weak majority. The Prime Minister stressed that the return of Ivo Sanader may lead to the fall of the government which would damage Croatia's negotiations with the EU. The election of Ivo Josipovic who will officially succeed Stipe Mesic on 18th February next reveals the political maturity of the Croats who are due, under the guidance of their new President, to join the EU in 2012. "Ivo Josipovic is a modern & cosmopolitan politician, open to the world and is interested in what happens outside of Croatia. A president like this will know how to help his country access the EU rapidly in the same way he will now how to encourage the institutions to undertake their work," stressed Damir Grubisa, professor of European Affairs at the University for Political Science in Zagreb. "I want a European Croatia not only via its accession to the EU but also via the shared values we defend; those of democracy, freedom, Human Rights, respect of the law and minority rights and religious freedom," declared Ivo Josipovic some hours after his election.